What is quality? For us at Thrillsales, excellence comes from BPA-Free plastic material, sturdiness and premium craftsmanship. That's what makes these seed trays superior compare to dull, off the shelves trays from other brands. Our quality-paired with world-class customer service is what makes us the best choice for garden accessories. Our trays are perfectly designed with durable PP material for your gardening/greenhouse needs. You'll never experience any sign cracking, melting, or snapping in half as you work on your botanical projects. They are sturdy and can support several months in constant warm, humid environment inside or outside the greenhouse, and resist temperatures as high as 80 degrees. Designed with you in mind, you can use them for seedlings, small plants, wheatgrass, cell planting, fodder, germination and much more. 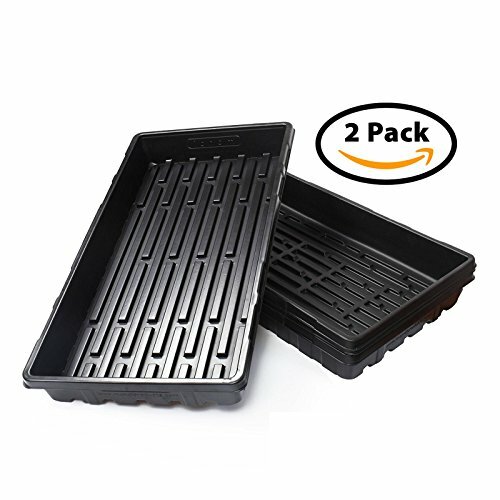 Measures: 21.25" x 11" x 2.36"
Click the add to cart button and order your premium set of 2 seed trays today! If you have any questions about this product by Dealsoftheday-US, contact us by completing and submitting the form below. If you are looking for a specif part number, please include it with your message.